High end mens and womens fashion store located in Washington D.C. In 1952 Sidney Lansburgh bought the company from the estate of Clarence Grosner. It remained an independent family owned business until 1988 when Hartmarx bought it. 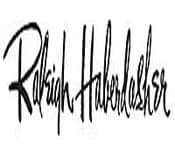 In 1992 Hartmarx sold Raleighs to HSSA Group Ltd. and six days after purchasing it they announced that they would be closing all of the Raleighs stores.